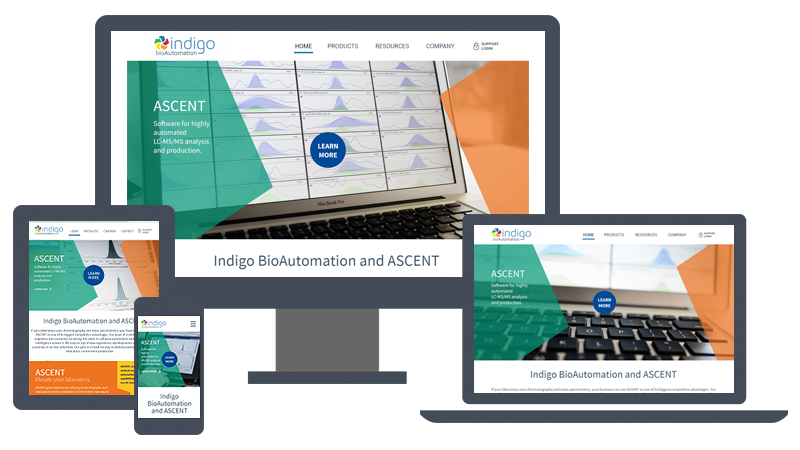 Indigo BioAutomation selected TBH Creative to professionally redesign their existing website and increase their conversions by creating a better digital communication tool to promote their software. Their current site had accurate information but was not performing well enough and had never had a professional design. They knew there was more potential to gain business through their website through improved graphics, stronger content, and more functionality including integration with Hubspot for increased lead generation. Indigo's Company Page with animated history timeline and video featuring the president. The marketing expert on the Indigo BioAutomation team left the company before the revamped website content was complete. TBH Creative's content expert was able to jump in, familiarize herself with the project, and pull together the remaining content needs despite the tight deadline. At TBH Creative, our group understands that unexpected issues may arise during the course of a project and we're here as your partner - prepared to pull together resources to finish on time and accomplish your goals. Furthermore, TBH Creative stepped in at the closing steps of the project to rework the logo because of a strategic name change from Indigo Biosystems to Indigo BioAutomation. We worked swiftly and assisted with the logo files as well as integration to the website and various print collateral. 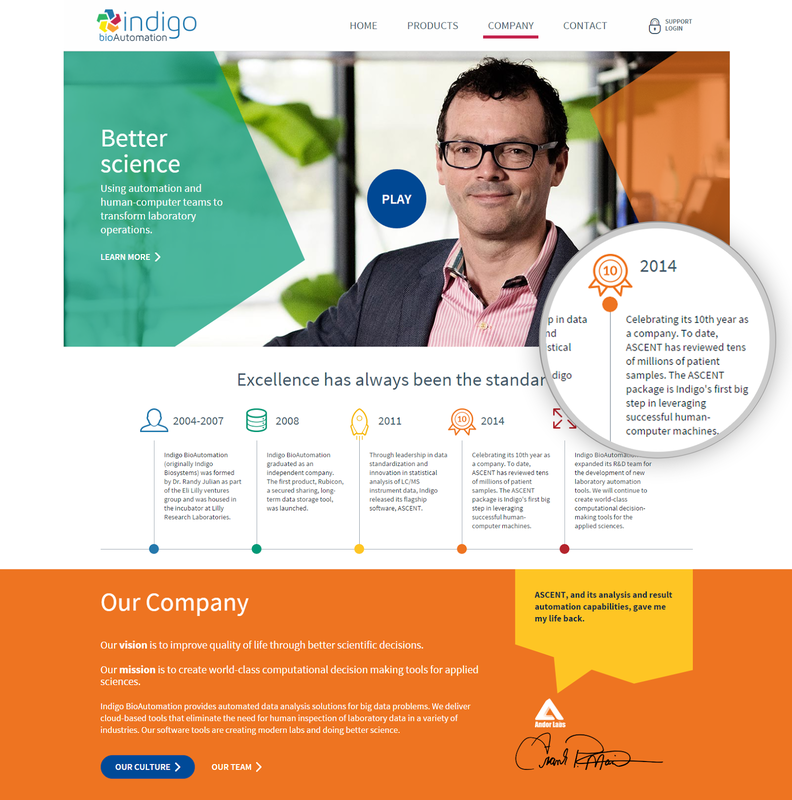 Launch a redesigned look that better supports the Indigo BioAutomation brand. Develop a fully responsive website that functions smoothly on any screen—laptop, tablet, or smart phone. Create a custom infographic to visually explain a complex process to customers. Integrate an easy-to-use content management system to enable the Indigo BioAutomation non-technical team to have better control over managing their content and pages. 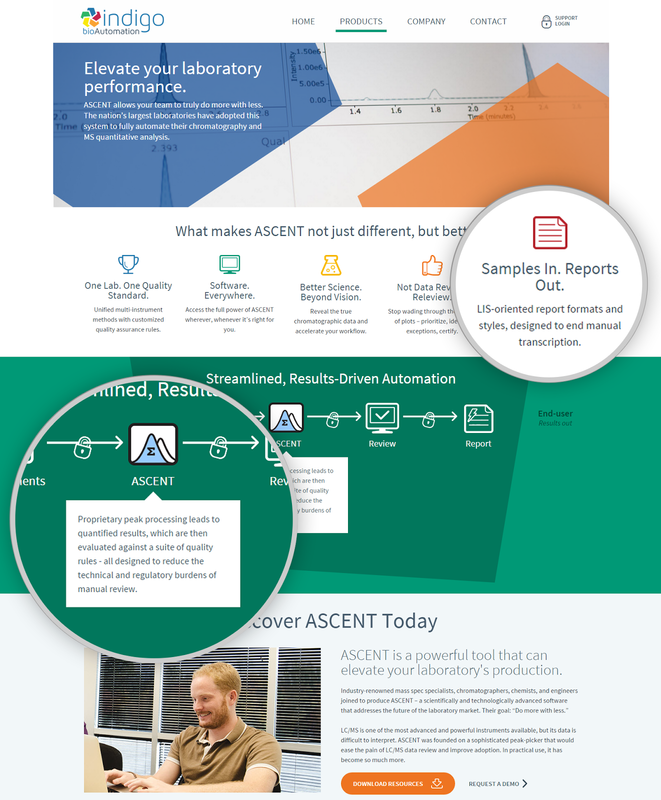 Indigo's main product page for ASCENT with animated infographic to show how it works. The redesigned website is a great first step to improved online marketing. We will be working with Indigo BioAutomation to continue to enhance their brand and develop a strategic plan for inbound marketing in the coming months. Indigo BioAutomation (then, Indigo Biosystems) had developed their first two websites using in-house personnel. The sites were generally well received and functional, and reflected the start-up nature of the company at the time: a blending of the company identity and its product(s). As the company evolved, however, we felt there was a need for a more holistically and professionally designed website, which provided brand identity for the company as well as clear and actionable information on its products. After investigating a number of other local companies, we decided on TBH Creative. TBH’s experience and expertise have been invaluable in bringing our goals to life. 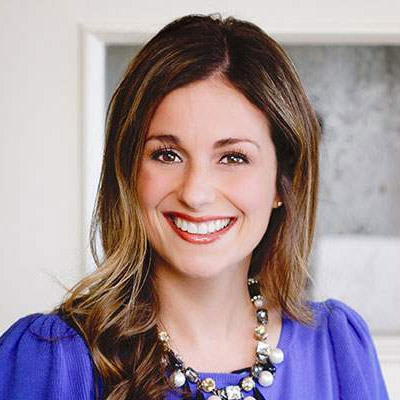 Starting from our very first meetings, Tatum and her team were extremely engaged and interested in understanding the messages we wanted to communicate, and provided several different concepts for us to evaluate. After deciding on a particular design style, TBH worked efficiently to lay down the framework, and made sure that we had ample opportunity to contribute content; they were also able to help us ‘tune’ our language for more effective communication. The content management systems (CMS) that TBH provides, which allows us to directly edit the website ourselves, is powerful and easy to use; it was a great aid in working collaboratively with our in-house personnel as well as TBH. As is sometimes the case, we had a bit of urgency in the last few weeks before ‘going live’ – we had an important conference where we wanted to make a big impact, and announce the company name change. Here, too, Tatum, Kayleigh and the rest of the TBH staff really helped us get everything ready, working with some compressed deadlines and final fit-and-finish details. The new website was launched exactly when we needed it to be, and so far, it has received rave reviews from both our internal stakeholders as well as customers. We credit TBH and its professionalism with helping us launch a website whose style and content align very well with our business goals. 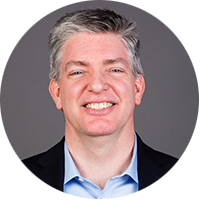 Indigo BioAutomation provides automated data analysis solutions for big data problems. Indigo BioAutomation delivers cloud-based tools that eliminate the need for human inspection of laboratory data in a variety of industries. Their software tools are creating modern labs and doing better science.